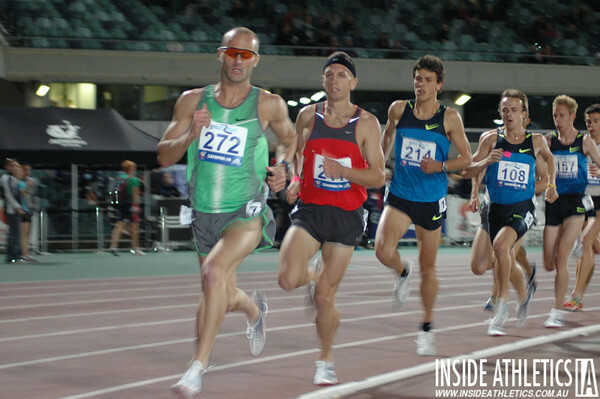 Justin Rinaldi is a current competing Athlete as well as Coach for 800m specialist Alex Rowe. Justin’s background in athletics speaks for itself. With an 800m personal best time of 1:47.62 and 1km best time of 2:21.80, there is no doubt Justin has the credentials to coach at the highest level. In 2007, Justin was given the opportunity to coach a young boy by the name of Alex Rowe in his pet event. With no coaching experience, he took on the role, knowing that his knowledge of the 800m race was far greater then majority of people in the Country. Fast forward 7 years and that young boy has just equaled the Australian 800m record, held by Ralph Doubell, with a time of 1:44.40. Thanks Justin for taking the time to talk to us. You have quite an extensive athletic career. Could you briefly explain your background in athletics? I had a good athletic career, but wasn’t an exceptional athlete by any means. Highlights; All Schools 1500m 1990, National 800m champ 1997 and two Victorian 800m titles 10 years apart (96 & 06) – the last one was on the hallowed MCG beating a young 19 year old athlete by the name of Jeff Riseley. Pb’s 1:47.60 & 3:40.60 (ran a quicker time over 800m but was DQed and the time never counted). Can you explain the reasons for accepting a coaching role? I never had ambitions of being a coach, but looking back on my own career, I was coaching myself for the last few years and was basically experimenting to see what worked and more importantly, what didn’t work! Those latter years helped lay the foundations of the program I now use with Alex. In essence, I had faith that I had the tools to help Alex achieve his goals. Were you nervous about taking on such a role with no experience in coaching? I’m still nervous about coaching Alex! He places so much trust in me and I would hate to do anything wrong. As my fiancé would attest, I spend hours upon hours going over and over Alex’s program making sure I’ve got everything covered. One of my strongest attribute as a coach is that I’m well aware that I don’t know everything, so I’m not afraid to ask others for their help/input. You have said that you had a goal planned for Alex to record a time of 1:44.50 in 2014. This is an amazing achievement, not only the time, but successfully managing Alex to reach this goal at the exact time planned. Can you explain how you’ve managed to achieve this? I’m lucky that two of my best friends are Paul Byrne (1:45.91) and Paul Cleary (3:36.20) who were both Olympians at 19. I’ve learnt from the mistakes they made at a young age, that prevented them from going on to become world class athletes (these mistakes are not just limited to mistakes in training). When Alex approached me when he was 15, I knew that we had to do something different to not fall in to the same traps previous talented juniors had. A perfect example would be making the decision not to go to the world juniors in 2010, when he was ranked in the top 5 in the world, and focus on year 12. We’ve also been very conservative in our approach to training and only made small increases to training volumes year on year. He’s biggest week, in term of mileage, this year has only been 67km. There is still lots of room for improvement, not only in his endurance capabilities, but also in his speed, where I’d like to see him get in the the low 46’s over 400m. Injuries are something that every coach has had to deal with. How did you go about coaching Alex through this recent Hamstring injury? We both learnt a valuable lesson from that injury and I’m 100% certain it will never happen again at that point of his preparation. I’m lucky that Alex has such an amazing perspective on life and he realises that while the injury came at a horrible time, it’s not the end of the world. We know that we are on the right track and all we have to do is to keep doing what we are doing and the results will follow. Lachlan is the Founder of Athletics Exclusive. His athletic background is basically made up of distance running, who competes in a range of events, varying from the 400m up to 3000m.